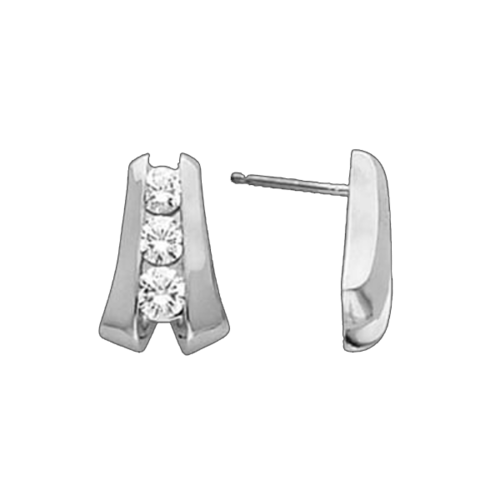 Adorable Platinum 1/10ctw diamond vertical bar earrings. 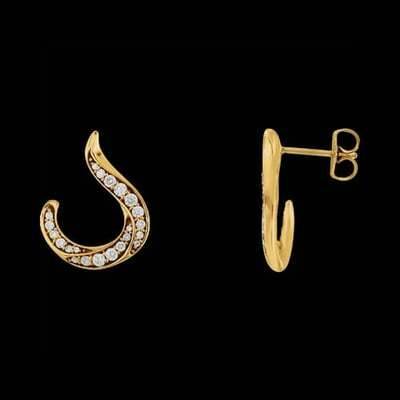 These delightful dainty diamonds are vibrant stylish earrings perfect for everyday wear. Cute Platinum geometric round design stud earrings. 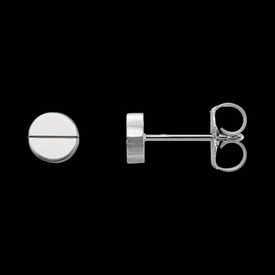 These little delights measure 4.92mm in diameter so very petite and of course include backs. Vibrant Platinum Diamond basket style studs. 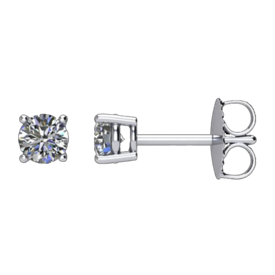 This classic diamond stud design is available in a variety of sizes, our price shown is for the 1/4ctw selection. 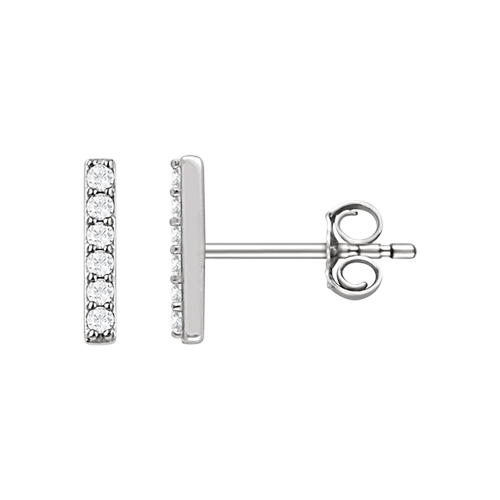 Diamond studs are a jewelry staple and are always a favorite gift. 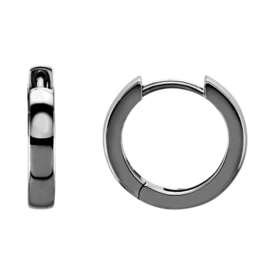 This pair of earrings is secured with a push back, if you prefer the screw back style use our request link to order those. Diamonds are SI 2 clarity G-H color. Diamonds really are a girls best friend, treat yourself or that someone special. It's the gift that lasts forever. With the Beauty and Durability of Platinum, it's easy to see why it is the metal of choice. Platinum ball earrings. These Platinum ball earrings are available in several sizes starting with a dainty 3mm ball up to a 6mm ball. Backs are also Platinum. Great earrings and naturally hypo-allergenic. 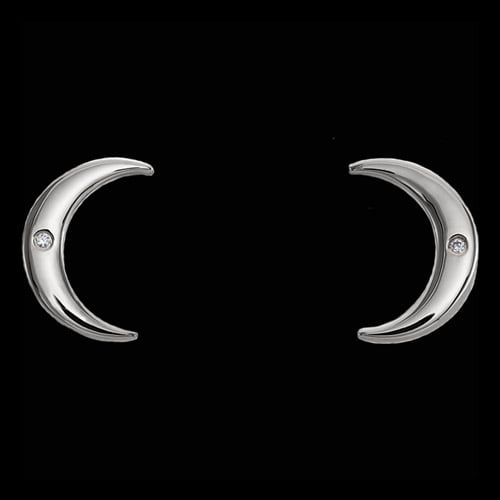 Platinum diamond crescent style earrings. 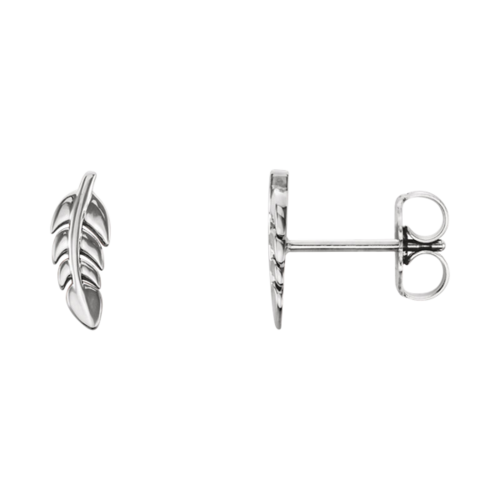 These delightful little earrings measure about 9.5mm top to bottom. 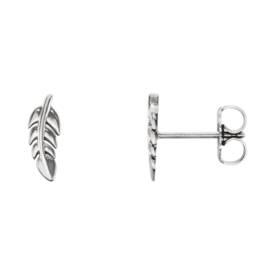 A great very affordable earrings for someone with gold metal allergies. This pair of earrings weigh about 1.7grams. 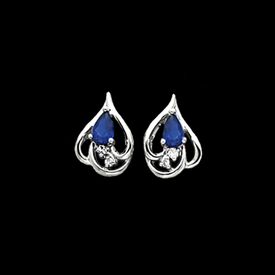 Find a HUGE selection of pure 950 Platinum earrings at our specialty site, www.PlatinumOnly.com. Stunning Platinum gemstone and diamond earrings. 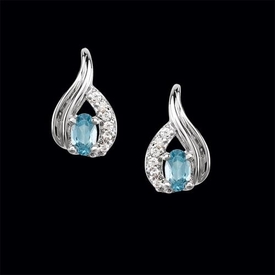 Beautiful modern pear style earrings feature a 5x3mm oval gemstone, shown with an Aquamarine and diamond accents. Diamonds are SI 1 clarity but dainty accent stones, total aprox. .12ctw for the pair. Order these lovely earrings with Aquamarine or another genuine gemstone selection. Platinum earrings are custom made to order. 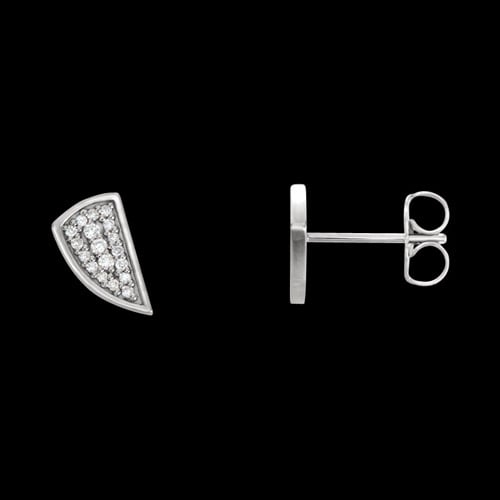 Beautiful fancy "J" design diamond earrings. 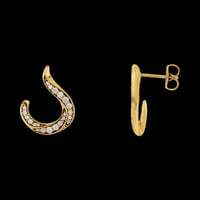 Earrings are shown in 14k yellow gold, also available in 14k white gold and by special order 14k rose gold or Platinum. Diamonds total 3/8ctw in this pair of earrings. They measures 16mm in length by 13.75mm across. 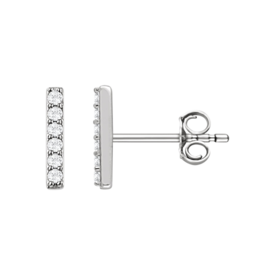 Casual Platinum diamond studs. 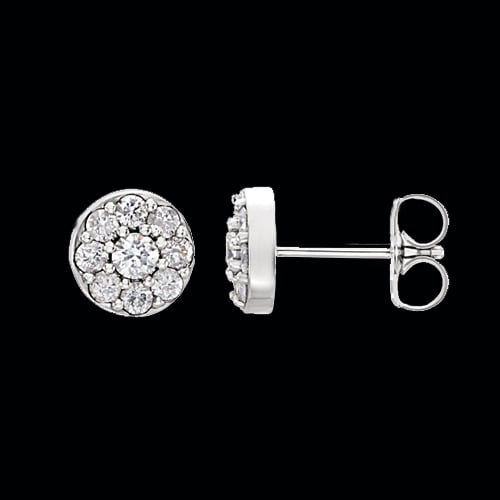 This great pair of everyday diamond earring studs will add a little dazzle to your day. Diamonds total 1/10ctw and the earrings are 950 Platinum. Earrings measure 9.22mm in length by 5.3mm wide. Luxurious Platinum Diamond Earrings. Diamonds total 1/2ctw in this beautiful pair of Platinum diamond studs. 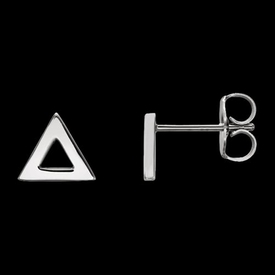 Each earring measures 7mm in diameter. Center diamond is a 2.7mm round SI2 G-H color stone surrounded by 8 1.7mm round SI2 G-H color diamonds. These are made to order and can be customized with your favorite precious or semi-precious gemstone rather than diamonds. 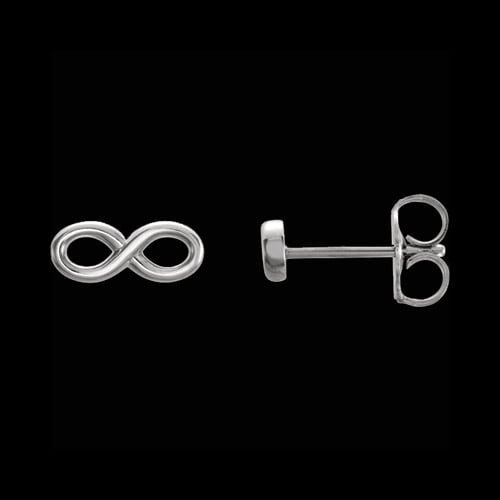 Platinum Infinity earrings. Adorable dainty Platinum infinity design earrings. This design measures about 9mm across. A great option for anyone with metal allergies. Find a HUGE selection of Platinum earrings at our specialty site, www.PlatinumOnly.com. 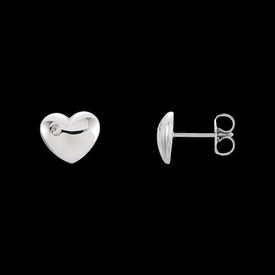 Delightful Platinum heart earrings with a diamond accent. 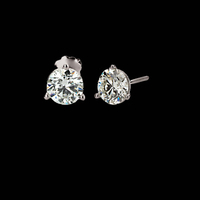 These great earrings are perfect for everyday and feature a polished finish and .02ct accent diamond. The pair weighs approx. 3.37grams. 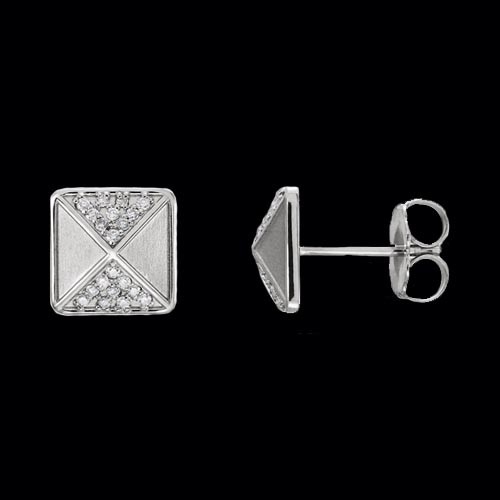 Incredible Platinum large diamond studs. These incredible Platinum diamond stud earrings total 1ctw and are secured with a screw back. Round diamonds are a brilliant SI 1 clarity G-H color. A martini style post, they are a favorite. We are happy to upgrade these to VS clarity simply use our request link for pricing. around 2grams. Polished finish and of course 950 Platinum. Incredible Platinum diamond earrings. Diamonds total 1 1/2 carats in this beautiful pair of Platinum diamond earrings. Each earring weighs 3.7 grams for a total gram weight of 7.4grams. An elegant earrings for that special event. Unlike rings, earrings are fairly easy to buy as a gift because one size practically fits all. 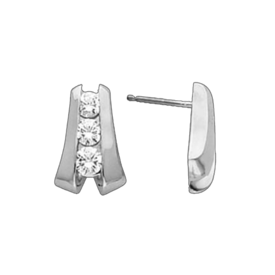 Shopping for the perfect pair of platinum earrings online is convenient and can save you a lot of time compared to choosing the best pair in store. You can easily check the availability and the custom options that Gracious Rose offers. You can also talk to our jewelry consultant if you need some expert advice. Payments are very secured and most purchases come with 1 year warranty against manufacturer defects. If you are buying platinum earrings as a gift, we can wrap it in a special box just for you.